The Los Angeles Motor Show wouldn’t have been complete without a fast “look at me” convertible. 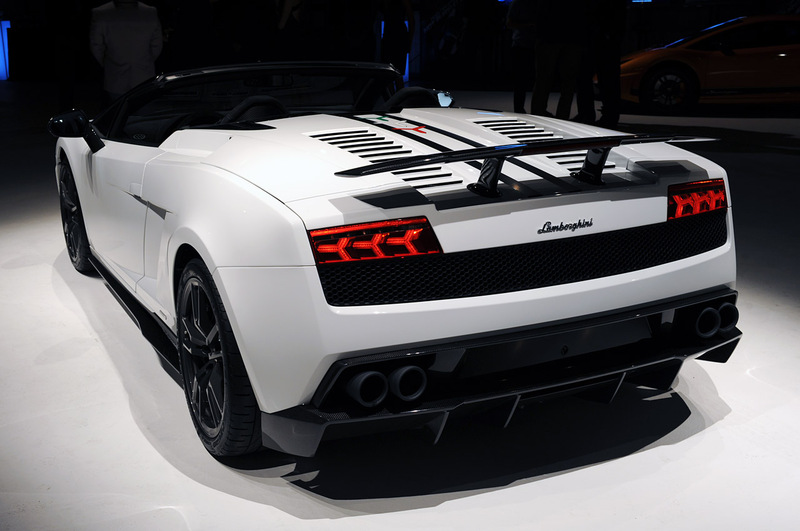 Guess this is what the Lamborghini Gallardo LP 570-4 Spyder Performante is. I don’t know but I reckon everybody gets bored halfway through this title. Heck, it almost made me yawn and we’ve got a Lamborghini Gallardo Convertible at hand. You see, while the Italians know design, they know engines and they know fun, they don’t always know marketing. A while back, they came up with a beautiful array of teasers before the release of the Lamborghini Sesto Elemento. Now though, it seems like they have been tired and went on holiday as some janitor came up with this very long name. Perhaps it’s not just the marketing department that didn’t bother very much. The engineering team did make the Spyder Performante lighter than the normal version by about 140 pounds but no more power is available. Apart from that the Lamborghini Gallardo Spyder Performante is looking excellent and it gets the same 570 horsepower V10 engine the Gallardo Superleggera is garnished with. That’s plenty, and just look at this thing. The word “epic” comes to mind.